Then yesterday after the party, it was cleaning day here at the Hotel Thompson. Shakes head – I hate cleaning day. We all do our share of dragging stuff to the laundry room, changing sheets, helping with dusting and taking trash out. Slave drives my humans. Then we all snuggled up for some television. One of our favorite classics was showing – The Wizard of Oz. We love that film! Back in 2013, I even broke down the movie according to my piggy thinking. You can read all about that here. Please read it if you haven’t and let me know what you think. Last night though, mom/dad saw this in the television guide – you know that tells you what is coming on television. This is how we knew it was showing last night. Snorts with piggy laughter! I gotta meet the writer of the television guide. This is awesome. Kind of what happens but not exactly right? Snorts!! Yes, all of a sudden this girl sounds like a maniac, a psychopath. Drug addict even … (because of the surreal landscape). Crikey Bacon …… I read your review of the movie. Brilliant, mate. Have you ever thought of doing that for a living?? But hey! … that television guide kinda stated what you’d already said except you threw in the stealing bit too. Fair dinkum ……. 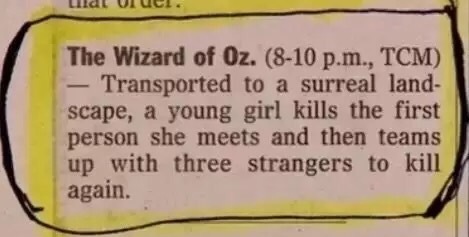 I’d never really looked at Dorothy in that light before. She was one bad Sheila, aye?? Auntie Em would be so proud!